The #Everest2018 season continues in an orderly manner. Teams are at base camps on both sides adjusting to their new homes, and the thinner air. The first teams have entered the Icefall on the Nepal side. 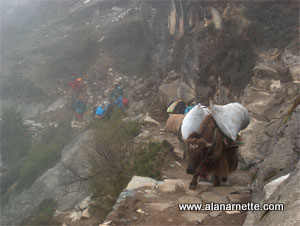 Soon the Tibet side teams will make the move to Intermediate and then Advanced Base Camp. It may seem strange to conduct training at Base Camp, and in many ways it is however better safe than run the risk of an accident. While most, with exceptions, Everest climbers have traveled on fixed ropes (Denali), used crampons (Rainer, Mont Blanc), used an ice axe (Vinson), many have not worn their 8000 meter boots, with crampons, and walked across a ladder over a 200 foot crevasse. So rather than experiencing it the first time at 18,500 feet in the Khumbu Icefall, now is the time to get all their systems dialed in. Another area to focus on is their harness. Again, many have worn a harness for rock or ice climbing but few had the semi-complicated setup of a jumar, and a carabiner that both need to be the precise length to support a fall and recovery. None of this is very complex but likewise the techniques should be second nature to each person. One of the famous features of climbing Everest are the ladders used to cross crevasses. In the Khumbu Icefall, there are usually between 20 and 30 crevasses, but for 2018 there are only three in the Icefall proper and a few more in the Western Cwm – very rare! There might be a couple at the base of the Lhotse Face. One the north side, there are several near crampon point as climbers ascend to the North Col. Most Nepal side climbers will make at least four round trips through the Icefall. The ladders are not always straight across a crevasse, in fact almost never. They can go down, straight up, be positioned at an angle, anything but horizontal. There can be dual ladders in high traffic areas. Sometimes an up ladder and a down ladder. Approaching the ladder, you pause for an inspection. How many ladders are lashed together? Not too bad if only one, but three, four or more, it sinks in the middle, it bounces. Watching a Sherpa crossing ahead, you see the wobble – left, right, up, down. It is 3D. The safety lines are in place so you look at the anchors, the place where they are secured to the ground, or more accurately, the snow or ice. The thin nylon line is tied in a squirrelly knot through a hole in a piece of bent aluminum – a picket. That’s all? Looking across the crevasse you see the rope tied to an ice screw, but in the hot sunlight the hole has melted out and the ice screw bobs freely. Knowing you have little choice, you approach the ladder as one would approach a live chicken. Carefully, slowly, you move your feet towards the edge. Bending over, you grab the right hand safety line, then with your other hand you press the locking mechanism of your carabiner inwards and clip onto the line. Your ‘biner is tied to your harness with a short piece of nylon webbing. Repeating this procedure, you are now hooked on both safety lines. Your life is now in the hands of the makers of nylon. Your crampon’s front points jut out from your boot as you focus your eyes on the first rung. The question is whether to put the mid part of your sole on the rung or to gingerly put your front points on one rung and the back of your boot on the trailing rung. The latter runs the risk of being caught when you lean forward, forcing the rung tightly against your crampons. Only a Cirque du Soleil move would allow you to free yourself. Seeing the Sherpas make this move gives you confidence so you move forward. The right boot settles on the ladder, then your left foot moves quickly in place. You hold onto the ropes with a grip so tight that if you fell, your shoulder would dislocate before your grip would release. Your hands are slightly behind you to pull the line taught. All of a sudden, the line goes tight from both sides. Teammates have squatted at both ends of the ladder to pull the rope tight making it more of a rail. You appreciate this and return the favor at the next crossing. One step is followed by the next and then a third. Your eyes focused on the ladder, your boot, your knee – anything other than the seemingly bottomless pit below you. In the middle of the span, you realize you have not taken a breath. At 18,000 feet, this is a big mistake. You pause and take a big breath. Looking up, you see Sherpas, strangers and a black dog looking at you, wondering. You wonder as well. A few more steps, your foot reaches the snow covered ground. You take another deep breath. Unclipping, you stand up straight, you had been slouching the entire time. Your mother would be unhappy. Looking around you feel good. The dog leaves you behind! Sherpa holds the line taught. I have been eagerly devouring every scrap of information about the annual Everest summit attempts for some years. This is an excellent blog. Love the photos. Thank you for your awesome Everest coverage, Alan. This is my first stop at the start of each day. It is also the closest I will ever come to climbing any mountain. May the winds of good fortune and success abound for all those on Everest this year. Thanks for the feedback Jetty. Glad you are enjoying this season, a lot more to come! As always, love the read and the pictures. I have been following IMG’s blog as well – it seems that they had their climbers practicing the ladders at home. Did you do this prior to any of your climbs of Everest? I did Mike. I put on my 8000 meter boots and crampons and walked back and forth on a 20 foot ladder suspended 3 feet off the ground on two patio chairs! I was wearing shorts and a t-shirt 🙂 I can say it was helpful but nothing like the first time I crossed a deep crevasse in the Icefall in the dark! How often are people actually falling off the ladders? Good read as always Alan… The Black dog??? What’s that all about 🙂 ?? Also, in an earlier blog you mentioned the fact that there will inevitably come a time when the Icefall is no longer passable… How will the South side be climbed in such a time…? It would make sense to me that if the Khubu Icefall is impassable, people will have to helicopter to camp 1, or potentially even camp 2. Or perhaps move to the North side altogether. There are many dogs in the Khumbu and occasionally one will follow climbers or trekkers all the way to EBC because they get fed by humans (mistake). Then one will actually follow climbers in the Icefall and all the way to camp 2 where a kind person will let them sleep in their tent, and continue feeding them until a kind Sherpa puts the hound in their pack and hauls them back to EBC. We had this scenario in 2011 with this dog. As for what happen IF the Cwm becomes impassable, probably helicopter to C2 because Nepal will not want to give up the $25+ Million Nepal sees in revenue associated with Everest each year. Hi Alan, love the photos, not sure how I’d manage to trust the anchors in this situation! If what you suggest does happen and climbers do fly all the way to C2, what are your thoughts on this situation? Is it really climbing the mountain, and would you have done it if that was required when you summitted Everest? I can see the day when helicopters will be able to land at the South Col and load/unload passengers. Uber rich will get out and do the summit with mass oxygen supplies from the start, then get back in and fly home. Flying to Camp 2 won’t be just about the climbers. It will be a logistical nightmare. Tents, food, hauling everything back out, etc. But they already started flying the upper mountain ropes and anchors for the fixed ropes up to camp 2 to minimize more trips through the icefall for the porters.